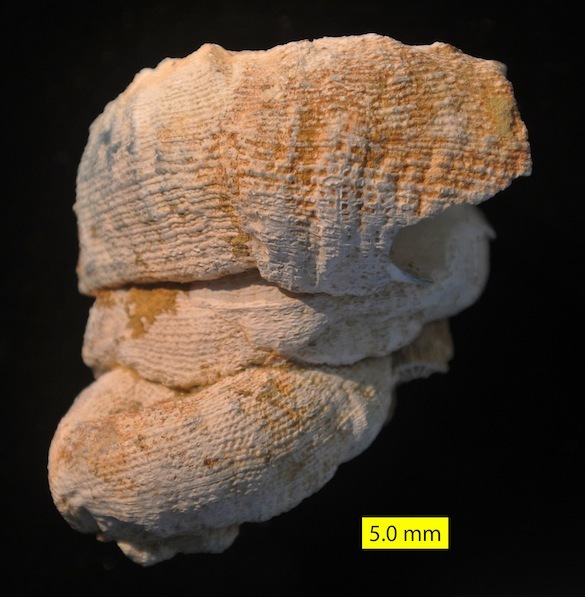 This week we continue with fossils from the Nicosia Formation (Pliocene) of the Mesaoria Plain in central Cyprus. These fossils are from a Keck Geology Consortium project in 1996 with Steve Dornbos (’97). 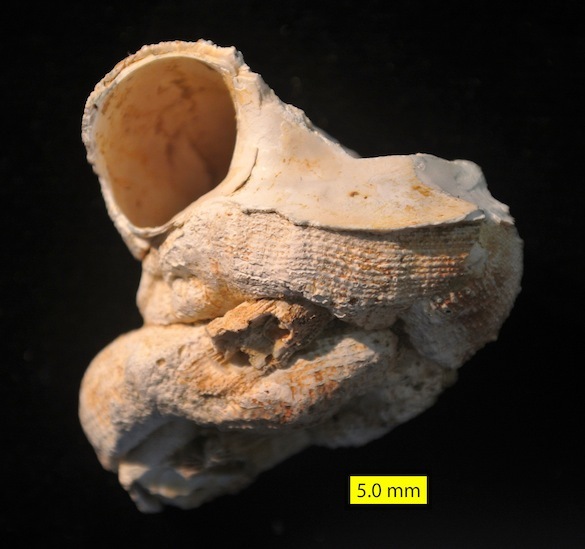 Above we have one of the most distinctive forms at the Coral Reef locality: the gastropod Vermetus Daudin, 1800. It doesn’t look much like a snail with its irregular, twisty tube of a shell, but the animal within was very snaily indeed. Vermetus and its relatives are still alive today, so we know a lot about their biology. They are sessile benthic, cemented, filter-feeding marine organisms, meaning they are stationary on some hard oceanic substrate sorting out organic materials from the water. They gather their food in one of two ways: capturing plankton in their gills (much like most bivalves) or making a net of mucus threads that is gathered occasionally with their radulae, with the food passed to the mouth. They have separate sexes. The male broadcasts sperm into the water column. The female catches some of this sperm in her mucus feeding net. She then broods the fertilized eggs in her mantle cavity. Vermetids are common enough that they are even used today to determine tectonic movements in the Mediterranean (Sivan et al., 2010). The genus Vermetus was named in 1800 by François Marie Daudin (1774-1804). Daudin was a French zoologist with a hard, short but very productive life. He contracted a disease in childhood that left his legs paralyzed, and thereafter devoted his time to natural history. He started (but did not complete) one of the first modern books on ornithology, combining description with Linnean taxonomy. His work on amphibians and reptiles was epic, finishing eight volumes that described 517 species. In all his research he was helped by his wife Adèle, who drew his hundreds of illustrations, including those below. She died of tuberculosis in 1804, and he died soon after only 29 years old. They both lived in poverty in Paris during the dislocations of the French Revolution. 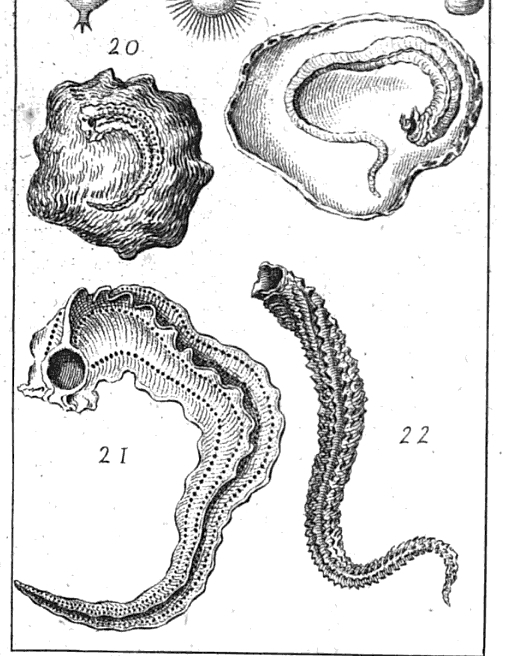 There are no portraits of François Marie Daudin, so the best I can do in his memory is reproduce some of the illustrations of modern Vermetus (drawn by Adèle Daudin) in his 1800 book titled (in translation) “Collection of memories and notes on new or little-known species of molluscs, worms and zoophytes”. Here’s to our memory of the Daudins. Daudin, F.M. 1800. Recueil de Mémoires et de Notes sur des espèces inédites ou peu connues de Mollusques, de Vers et de Zoophytes, orné de gravures. Chez Fuchs, Libraire, rue des Mathurins. Treuttel et Wurtz, quai Voltaire; 50 pp. Sivan, D., Schattner, U., Morhange, C. and Boaretto, E. 2010. What can a sessile mollusk tell about neotectonics? Earth and Planetary Science Letters 296: 451-458.